Looking for a remedy to improve your skin? Look no further than mother natures antibiotic ... raw, unheated honey ... what you can also find in our cold pressed juices! "Honey just might be Mother Nature’s premiere treatment for skin; the sticky stuff has a host of benefits. Along with improving skin hydration, the antioxidant-rich nectar attacks bacteria (including Propionibacterium acnes, the strain that causes acne) and can even help heal infections and prevent new ones." 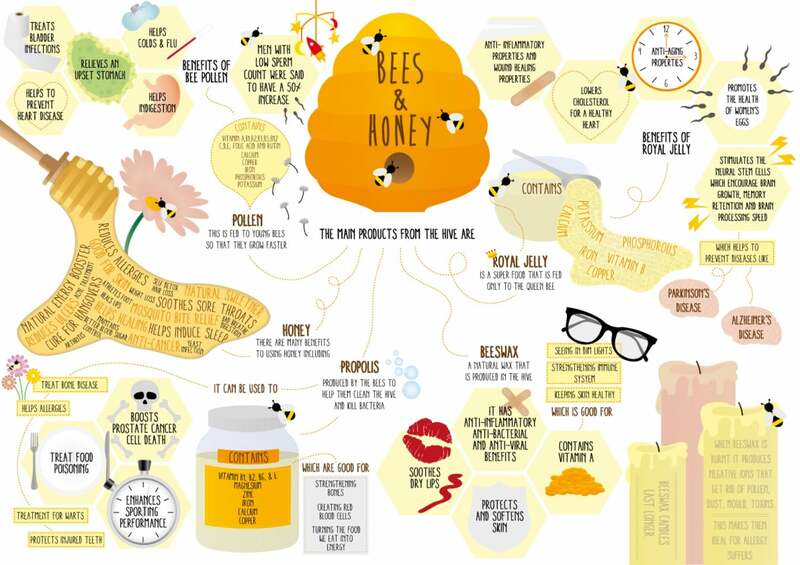 We love this infographic on the many "beni's" of raw honey. Check it out. Read it and then go support the bees and purchase one of our raw honey drinks! Looking for recipes to continue your healthy eating from the summer? Try this easy-to-make smoothie made with our apple ginger manuka booster to start your day in a healthy ways. Blend the raspberries, strawberries, blueberries, bananas, greek yogurt and Honeydrop Apple Ginger Manuka Booster in a blender until smooth.